Exploring a healthy lifestyle through exercise and delicious REAL foods. Sooo, I’ve been training for a half marathon for about 3 weeks now, but I’m not going to sign up for it until I have been going at it for a month. I always go back and forth or something comes in the way and I quit my running routine. It’s going pretty well so far! That is also why I haven’t been going to CrossFIT as much. The running program I am using has a schedule of running 2-3 times a week with some strength training and cross-training thrown in. I really like the variety and think I would be bored with just a strict running schedule the entire week, maybe that’s why it hasn’t worked for me before. Anyway, I’ve been having a tricky time figuring out what I want to do on the cross-training days, which is hilarious because that used to be ALL I did. Last week I went on a 24 mile bike ride, and the week before swam for a half hour. This week I wanted to change it up again, and try something totally new. That is how the dice workout was born. I LOVED it. 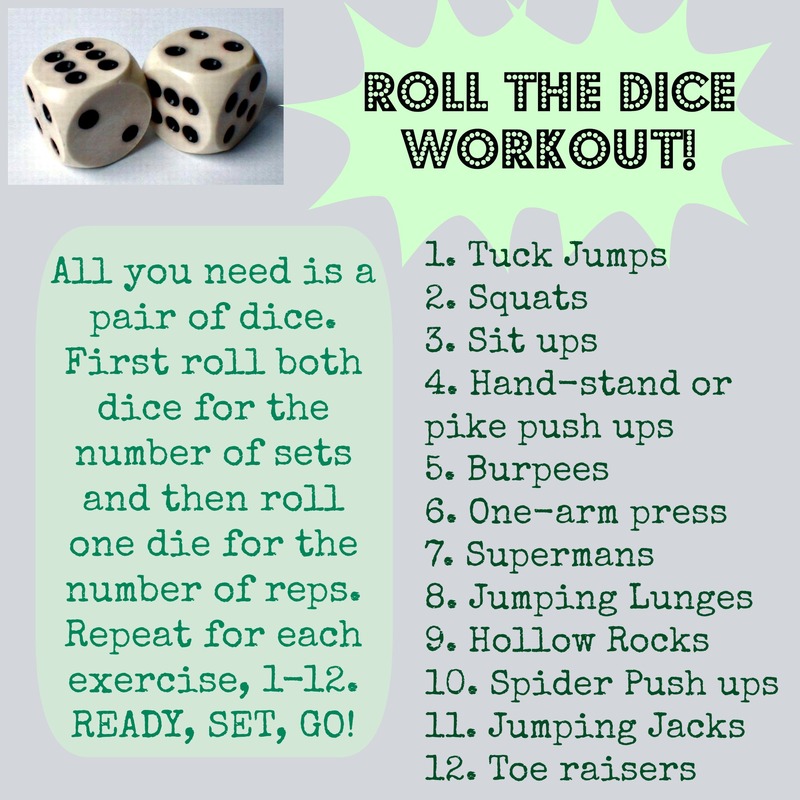 It ended up taking me more than the scheduled 40 minutes, but you can cut down the number of exercises, or only use one die to roll the number of reps. It is easily adjustable. The best part is you don’t need any equipment, just a pair of dice! One arm press: I saw this exercise at Real Simple magazine, and thought I would give it a try. It’s a good one! Hollow Rocks: Here is a video of the hollow rocks. This is a throw back to the gymnastics days. …I should really type up a workout, yea, a workout that used to be our warm-up. Oops. Anyway, these are an awesome core builder. But they are really easy to do incorrectly, and then they hurt your back. So if you can’t do them right, don’t do them at all. Lower the number of reps, or just do hollow ups. (Like a superman, but laying on your back). Spider Push up: This is a picture of the spider push up. It really engages your side obliques during the push up. It’s horrible awesome. I couldn’t find the original source of this picture, if anyone knows/finds it..Let me know! Toe Raisers: Stand with your feet shoulder-width apart. Slowly raise up to the ball of your foot and lower slowly back down. Great for balance, concentration, and your calves! You can substitute your own exercises instead of the twelve listed. It might be fun to do this with only a arm, or leg workout, and only list exercises for the same muscle groups. You could also try with entirely cardio exercises. I tried to do a full body workout and targeted multiple muscle groups. I wanted to incorporate cardio, upper and lower body, as well as your mind (concentration and balance). It truly is a full body workout. I hope you like it! **Know your body. Don’t do 6 reps of 12 spider push-ups if you haven’t ever tried them before. Be safe! I’m so excited! One of my best friends from high school is getting married in August and her bridal shower is tomorrow! Yippee, I can’t believe we are that grown up! What is your favorite no gym workout or exercise? What’s your weekend looking like!? 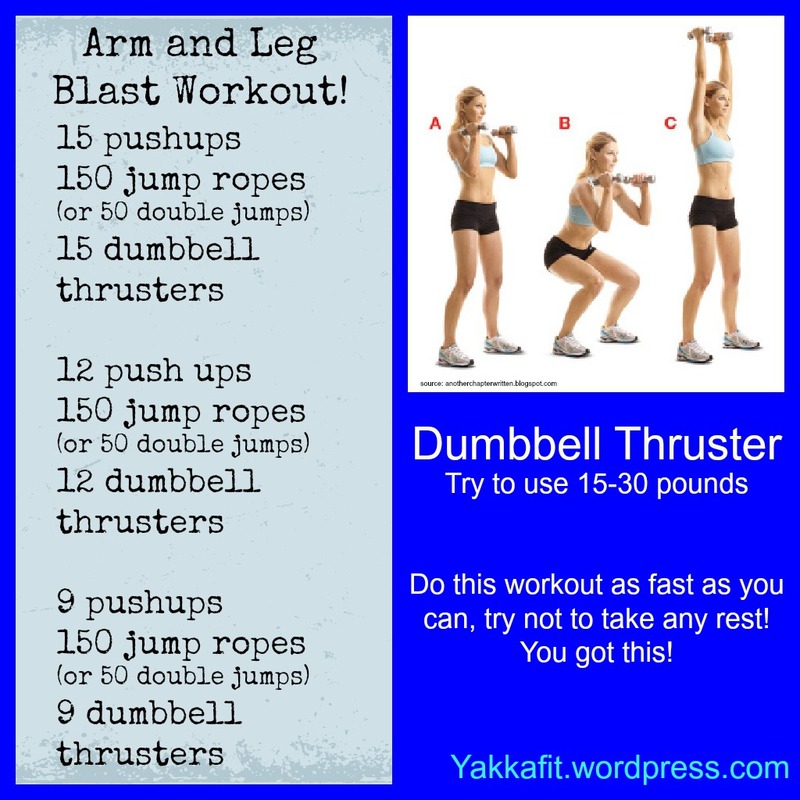 Ready for a quick workout that will burn your legs and arms!? This is an altered workout of the one I did this morning at CrossFIT. I thought it was a pretty difficult workout and I loved that it worked my arms, legs, and provided a cardio workout. And it is quick! I used 30 pound dumbbells, but from 10-30 pounds would provide a difficult workout. If you don’t have dumbbells at home, and can’t make it to a gym you can use all sorts of household items. Filled water bottles, sauce jars, soup cans, really anything with some weight behind it that can fit in your hand will work. I’ve even used wine jugs once (long story). Here we go! After you finish this workout make sure you stretch out your hips with some lunges on the floor. Stretch your shoulders across your chest as well as holding your elbow up behind your head. What did you think!? Happy 4 months beautiful baby boy! We're soaking up every second, you're changing so much, so quickly!😭🥰 . . Out the ocean sailing away I can hardly wait to see you come of age But I guess, we'll both just have to be patient 'Cause it's a long way to go... . Before you cross the street Take my hand Life is what happens to you While you're busy making other plans . Beautiful, beautiful, beautiful Beautiful boy. Follow Blog via Email, All the Cool Kids Are Doing It. Leah Renee on Big Moves!